After the “catastrophe signal’ – When science entered the policy greenhouse | Watts Up With That? A new book on the origins of the global warming movement tells how the Intergovernmental Panel on Climate Change was first pressed into policy based evidence making. For Seitz and others, responsibility for the deception sat with Ben Santer, the coordinating author of the ‘detection’ chapter. However, although it was indeed Santer who had made the changes, it is now clear that he was not acting alone. Instead, there appears to have been an orchestrated campaign to alter the scientific findings so that they could justify the US policy change. This is most evident in an official US government submission to the IPCC. It was supposed to be suggesting changes only to the wording of the report’s summary, but shows Washington pressuring the IPCC to change the underlying scientific chapter. It asked for recent findings on the effects of sulphate aerosol emissions to be used to justify a ‘smoking gun’ detection claim, and for the removal of uncertainty statements that stood in its way. The submission was written by Robert Watson, a British chemist who had recently taken up a position in the White House. When previously at NASA, Watson had been at the centre of an earlier scare – over destruction of the ozone layer – where he had shown a deft hand in public relations, keeping scary stories in the headlines so as to maintain pressure for a complete ban on CFCs. By 1989, concern over an ozone ‘hole’ in remote Antarctica had waned, but just before a big ‘Save the Ozone Layer’ conference, Watson declared that Arctic ozone was ‘primed for a large destruction’ in coming days. Watson knew very well that there was almost no chance of a northern ‘hole’, but his warning had the desired effect, winning headlines around the world and undoubtedly influencing the European’s decision to wind up all production of CFCs. Scientists’ ability to catalyse policy action did not go unnoticed. By the time of the 1992 Rio ‘Earth Summit’, political attention had shifted towards regulating fossil fuels and many country delegates queued up behind George Bush (senior) to sign a convention to do just that. Still, the US had been holding out on binding commitments to emissions targets. The next year, when Bill Clinton arrived in the White House, change was in the air. The only trouble was with the science. There was still no hard evidence that emissions were having the effect that the climate models were suggesting. In fact, the IPCC had been retreating further and further from making a ‘detection’ finding. Its first assessment in 1990 warned that detection might not be achieved for decades. A special report for the Rio summit was even more sceptical. By 1995, the scientists were declaring that ‘we don’t know’ when detection might be achieved. This could hardly justify drastic climate action. The first step towards rectifying the situation involved a claim that sulphate aerosol emissions had been damping warming in recent decades. This is how the climate modellers could explain the lack of recent warming while still predicting a future catastrophe. Still, the argument for detection remained weak. But then, at the eleventh hour, Santer made a dramatic new discovery. The aerosols effect also distorted the expected geographical pattern of warming, and he claimed to have found this very pattern in the climate data. However, his announcement came after his chapter of the IPCC report had already been drafted and reviewed. While it was agreed to include the new findings, there was heavy and sustained criticism from his peers, and this explains why he retained a very sceptical conclusion. All that remained was for the country delegates to accept the scientists’ report and agree on a summary at a meeting in Madrid. But it was leading into that meeting, in their comments on the summary, where the US said that the report needed changing. Watson made specific suggestions on how to use Santer’s new findings to support a detection statement. The State Department cover letter was less specific but more insistent, asking ‘that the chapter authors be prevailed upon to modify their text’. In Madrid, Santer was again invited to explain his discovery. When he declared that his chapter was out of date and needed changing, the Saudis and Kuwaitis protested that the new findings were only preliminary and they also questioned the probity of national delegates changing the text of the scientists’ report. But this was dismissed as the carping and blocking strategies of vested interests; the changes the US wanted were made. Many years later, Houghton published a reflection on the Madrid meeting under a banner ‘Meetings that changed the world’. As he saw it, without the triumph of science over the oil lobby at that meeting, global action on climate change could not have proceeded to the climate treaty agreed in Kyoto two years later. According to Houghton, passage of the famed ‘discernible human influence’ statement saved the treaty process. Considering its effects on later events it’s hard to disagree. But what is not widely known is that this policy driven finding also saved the IPCC. 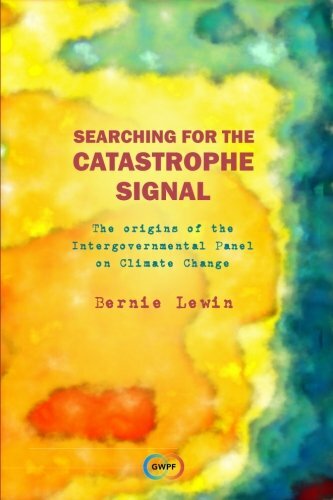 Bernie Lewin’s book on origins of the global warming scare, Searching for the Catastrophe Signal, is published by the Global Warming Policy Foundation. November 24, 2017 in Book Review. I have yet to see any such evidence that can withstand honest scientific scrutiny. I am sure you not see…..
I’d like to see the balance scale on which they did the weighing…. I think it started much earlier, in the 1970s, with the Club of Rome gang and their stated need for something like Global Warming to scare the sheep into more global governance. The IPCC naturally followed. But great to get more details on how this sausage was made. One might even consider the Marxist indoctrination into western academic institutions by the former USSR in the 1950/1960’s. Remember what Nikita Khrushchev had said…and then think how by 1995, it was our own academic institutions that were intent on crippling western civilization through energy policy. President Put@n appears to have picked up where/when the Soviet Union collapsed. The old USSR planted the seed, and now we are watering it. It’s not completely a Chinese hoax President Trump, it is the remnants of the entire Cold War that have been rearing its ugly head for the last 15-20 years. And China and Russia continue to dominate the IPPC philosophy, as well as the UN Security Council. Stalin and Khrushchev had Lysenko. Once Kruschchev lost influence (right after the Cuban Missile Crisis embarrassed him so badly within the Politboro), so to did other Soviet academics feel free enough to begin attacking Lysenko’s junk science. If Trump can get a solid White House Science advisor, a Lindzen or someone of his stature, to begin attacking the the alarmists, their little house of failed predictions will crumble around them as other scientists outside government finally feel free to pile on. The book looks at the development of the scare from 1950s on I believe based on an interview on GWPF TV site with Andrew Montford. Sheep just love to be lead. “Suggests” and “Discernible”, maybe. Significant or Catastrophi do not follow from these weak terms. “Bill Clinton was president…..Al Gore vice president”. Yeah…and look how much money Al made out of this businesses. And what a windmilling disaster followed. A finding can always be said to be “consistent with” with the burden then being on proving otherwise. It’s a very good technique actually. Every good scientist will admit how alternative explanations must be eliminated based on predictions. The alternative explanation to AGW is that the modern warming observed is also consistent with natural variation of climate if the paleo-climate records of the last 5000 yrs of the Holocene are considered. It is why Mann and others were so intent on erasing the Medieval Warm Period and the LIA from their reconstructions. t is why Trenberth was so insistent that the null hypothesis be reversed, even though natural climate variability has been unquestionably the rule (with an occasional climate changing bolide or comet impactor) for the last 4 billion years of Earth’s history. …with your collective funding used for the salaries, travel, office space, and parties. I have not personally been affected by global warming, nor noticed any change in temperatures or the weather. If they genuinely find someone who has been impacted and noticed a change in the climate, they should let us know who that is and we can check it out. They can also include the 2000 billion animals and plants in that as well. Winters in this century where I live haven’t been as cold as those in the ’60s and ’70s. But there’s every reason to suppose the difference is just natural cycles. They’re still plenty cold, just not with the extreme years such as 1968. Weather now is less extreme. I hope it stays warm forever, but of course it won’t. Earth is still in an Ice House interval. The main effect has been an ongoing educational series of what politicized science looks like, the extent of bad research, and the reach of advocacy groups. How else can you persuede large numbers of people to part with their money with out rebelling? Glad to see this published. I will get and archive a copy. The Santer last minute approved draft to final change story is well supported factually including by Santer, but is far too little known. Hansen 1988 and FAR, Santer attribution SAR, Mann hockey stick TAR, extinction scientific misconduct in AR4 WG2 ( fully exposed in essay No Bodies in ebook Blowing Smoke), the clouds changes in AR5 WG1 chapter 7 between SOD and final. All the little deceits that built up the big deceit called CAGW. Of course now unravelling as Ma Nature is not cooperating concerning temps, accelerating sea level rise, Arctic ice and polar bears, while renewables continue to fail on cost, intermittancy, and lack of grid inertia. CAGW is living on borrowed time. The smart hustlers know it. They got a small reprieve by the 2014 almost-El Nino and a big reprieve by the 2015 Big Kahuna El Nino. Those effects are dying away now. The sun will stay quiet for the next 3-4 years. And Trump and his cabinet will be pulling back the funding on the climate hustlers. The clock is ticking on their climate party. CAGW is living on borrowed time. The smart climateers know it. CAGW is living on borrowed time. You know it Rudd. The smart hustlers know it too. They got a small reprieve by the 2014 almost-El Nino and a big reprieve by the 2015 big El Nino. Those effects are dying away now. The sun will stay quiet for the next 3-4 years. And Trump and his cabinet will be pulling back the funding on the climate hustlers. (I’ve tried various modifications to take out even the fainest hint of disallowed words. still WP is blocking my reply). Google-WordPress censorship is real. ….. or more appropriately, under “Fantasy”, or “Children’s fairy stories” . This book will be labeled heretical. The balance of our western political and financial future, predicated on a single phrase, from a failing political institution. How utterly pathetic that our collective governments threw themselves into such a frenzy over it. When this all ends, there should be political heads rolling, living and deceased. It has been, and meanwhile continues to be, the most expensive fools errand ever devised by a minority group of socialist, ideologist’s to displace capitalism as the dominant, most successful planetary wealth distributor ever devised. And to be fair to them, it has been extremely successful, well, for the socialist ruling elite and their cronies at least. The poor have still seen nothing from this reckless endeavour. But that’s entirely consistent with socialism. You are so right…the poor will never see any betterment from this. The advocates insist that it’s science (when they know it’s really politics). One would have to be living in a cave the last 3 months to not have noticed how the liberal media and liberals in general have finally turned on the sexual predators in their ranks. Those men were silently protected both actively and passively by liberals. Even Bill Clinton is likely to finally get his comeuppance. The Left has finally had to admit they were being accomplice to it all by their abetting silence. And the men thye protected all those decades are being excoriated. The point that I am making by bringing this up is that eventually everyone gets their comeuppance when they repeatedly make big public lies and have the media at their back to remain silent and even write protection pieces to their bad behavior with an approving nod. So too will this too will happen to the climateers: the government Climateers; Santer, Trenberth, Schmidt, and the non-governmental ones in academia: Mann, Hayhoe, Dessler, Overpeck, and so many others. They will one day face their own day of reckoning and comeuppance for the climate pseudoscience they have pushed via their participation in the IPCC process, their failed models and claims of attribution, and their published “findings” n the name of alarmism. And it won’t just take them down. The big name Journals will get there comeuppance. The Science Academies will get theirs too. Eventually their fellow scientists will have had enough of the pseudoscience alarmism, and will turn on them. It will happen. But maybe not soon enough though before many of them can retire like Hansen. Or this could end like Nixon’s War on Cancer, with the participants acting as if they were never involved. When I was a little kid the snow was sometimes chest deep. Now it is a rare decaf all eventvto see accumulation of any amount. Of course like tens of millions of Rust Belters and New Englanders I moved to the Sun Belt Los Angeles to Atlanta during that span. So there you have it. Tens of millions of Americans with direct personal experience influencing their perspective. The problem is that the AGW conjecture is based on only partial science and is full of holes. CO2 is not a source of heat energy so CO2 can only warm the surface by enhancing the insulation effects of the atmosphere. If CO2 really affected climate than the increase on CO2 over the past 30 years should have caused at least a measureable increase in the dry lapse rate in the troposphere but such has not happened. The AGW conjecture is based upon the existance of a radiant greenhouse effect provided for by trace gases with LWIR absorption bands. 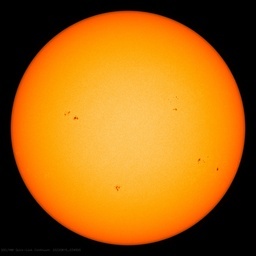 A radiant greenhouse effect has not been observed in a real greenhouse, on Earth or enywhere else in the solar system. The radiant greenhouse effect is science fiction. Hence the AGW conjecture is science fiction. So the political stance of the IPCC is based on science fiction and ignores the true science associated with the Earth’s climate system. Ahh, but that is where the climate models come in. The models project that….. The CO2 theory of AGW is Cargo Cult Science in action. A specialty of bureaucracies that have existed beyond their purpose. Which was day one in the case of the UN IPCC. author’s first name is misspelled in the intro headline. Yep, Absolutely NO sign of any CO2 warming in the satellite temperatures. because everyone knows that El Ninos are nothing to do with CO2 or human anything. When you do that, there is…. That means there is NO CO2 warming in the whole satellite temperature era. There is NO empirical PROOF that CO2 causes any warming in our convectively controlled atmosphere. Interesting. I am a sceptic on AGW, but – “Everybody knows” is a red flag. On what evidence do you say that El Ninos are nothing to do with CO2 or human anything? What Houghton and Santer and all the others who drove the “humans are responsible for destroying the climate” as expressed by their ideology supporting construct, the IPCC, could never have envisaged is the increasing likelyhood that their pet Elitist owned project to change the world forever is beginning to destroy the repsct for science, a cafrefully built up and long standing respect for science , the use of that respect for science being the only real factor that allowed them to force their Elitist owned ideological beliefs onto the rest of mankind. Global warming / climate change is the “top down” ideology of the Elites of this world, an ideology that the Elites intend to be imposed onto the rest of humanity. There was NO common man “bottoms up” aspect to the creation and devolpment of the Global warming / climate change ideology. 2. The role of the IPCC is to assess on a comprehensive, objective, open and transparent basis the scientific, technical and socio-economic information relevant to understanding the scientific basis of risk of human-induced climate change, its potential impacts and options for adaptation and mitigation. The IPCC was NEVER about studying the global climate as the prime objective behind its formation. And from that and that alone flows every one of the increasingly devastating items of political and scientific stupidity and irrationalism that has slowed and is destroying human development and human progress in so many nations, all allied with a now endless stream of scientific debacles and the wholesale corruption of the scientific process and of the scientific establishment. Assuredly not something that Houghton, Santer and all those other Madrid Conference attendees ever considered or ever envisaged as the probable final outcome of all their smoke filled back room political manouverings. So they formulated a story by eliminating any who produced observations or experimental data which ran counter to the theme. And since then have continued to cherry pick observations and experiments which bolster their claim while ignoring all other observations and experiments. That is not science. Where’s the catastrophe signal in this new 2000+ year proxy series from China? Those who need to read this most, the True Believers, wouldn’t touch it with a ten-foot pole, and if presented with any of it, would respond in knee-jerk fashion, with liberal use of the D-word, plus “consensus” plus the usual litany of “evidence” – “the arctic is melting, seas are rising, and extreme weather is increasing”, plus a smattering of their “climate knowledge” such as “the physics of greenhouse gases dictates that CO2 added to the atmosphere will trap heat and cause global temperatures to increase”. Then, they’ll use one of their favorite smears comparing those who question “the science” are akin to the campaign of the tobacco industry’s attempts to discredit the links between smoking and cancer. Indeed, the irrational, emotion-based response of the CAGW Believers to anything which discredits their quasi-religion is what is so amazing about all of this. If only they had a brain. They do (hAve a brain) see how well the are living. The game is simple, uncertainty is the enemy of action, so if you want action you have to remove the uncertainty, by fair means or foul. My impression is that the answer was decided in advance, the doubters were ejected, and those who would gain from action and alarm were an unstoppable force. With hindsight, why was the decision left entirely to scientists, who have clearly benefited bigly from the alarm? I’m sceptical about the notion that governments were drivers of the evolution, looks to me more like they simply adjusted their stance to maximise their chances of getting re-elected by their core voters. You seem to be forgetting Al Gore, he certainly was one of the main drivers and made more money on the scare than any one else. I’m reading the book on Kindle. I hear there is a new book on the origins of the herpetology movement, that ought to be a good’n too. By the same person that wrote about the origins of the calculus movement. Principle 15 allowed the EPA to assert that a one percent probability of an environmental threat justified a response to that perceived threat. This interpretation leads policy makers to sidestep any need for compelling scientific evidence of a threat. The fallacy of the EPA interpretation is that probability distributions have two tails. A correct analysis must consider the entire distribution of possible events, not just the extreme high value event. The EPA ignored the low-probability, high consequence cooling event in their analyses. The consequences of a warming earth are no greater than the consequences of a cooling earth. Policies appropriate for the warming case would be diametrically opposite to those appropriate for the cooling case. Under this reality, promulgating environmental regulations with too little information is illogical. The likely damage from acting on the wrong premise, a warming or a cooling planet, nullifies arguments for either action until the science is right. The policy framework of the EPA is fatally flawed and taking the U.S. in the wrong direction. Seems you’ve decided already. If the science is right will you change your mind. Nobody is going to take bets with you. You DISHONOUR them. ….. a period when atmospheric CO2 has been at its most beneficial for life on Earth.. Pathetic. Less brains than a Clod of manure. Tom, may I suggest that more relevant to your case is a 1977 amendment to the US Clean Air Act where the EPA Administrator was given the power to regulate any substance that may be reasonably anticipated to affect the stratosphere. The reasons behind this change, and its interpretation that empirical evidence is not required, are discussed in the book. The link you make is right where the UNEP ( and its 20th anniversary summit) play the role internationally that the EPA has played domestically in the USA since its inception to resolve the DDT impasse between the science and the scare. Probable cause was in and the prudent man rule was out. Most don’t know the difference? As an ecologist who studies lake and ocean food webs, I can say that most ecologists have been surprised at the strong effects of climate change on plants , animals and natural systems. We see that lakes are warming faster than both land and oceans (based on a recent synthesis of about 230 lakes world wide). We also have data on reduced duration of ice cover on over 1,000 temperate zone lakes. Changes in bird migrations, breeding of many insects and amphibians show responses to warming. Northward migration of plants in the Northern Hemisphere has also be been pronounced. In Europe alone there is data on over 500 species of plants that have taken advantage of warming to move northward. When I was working in The Netherlands in 2009, I was really surprised by the number of studies showing plants from Spain that had moved northward into France, The Netherlands, Germany and even Scandinavia. The ecological effects of warming are already very strong.